MANILA, Philippines - ABS-CBN's noontime show “It’s Showtime” celebrates it's 8th annivesary this October with the highly anticipated “Magpasikat Week" 2017 happening in the third week, October 16-20 for the performances and announcement of winners on October 21. The brightest Kapamilya stars and hosts are set to clash to bring good vibes and special performances, such as dance numbers, and singing showdowns, among others. The 2017 "Magpasikat Week" features first timers James Reid and Nadine Lustre (JaDine). The madlang people is set to witness the spectacular performances by Team Billy, Amy, and James; Team Vice, Jugs, and Teddy; Team Anne, Ryan, and Nadine; Team Vhong, Joey, and Mariel; and Team Jhong and Karylle. 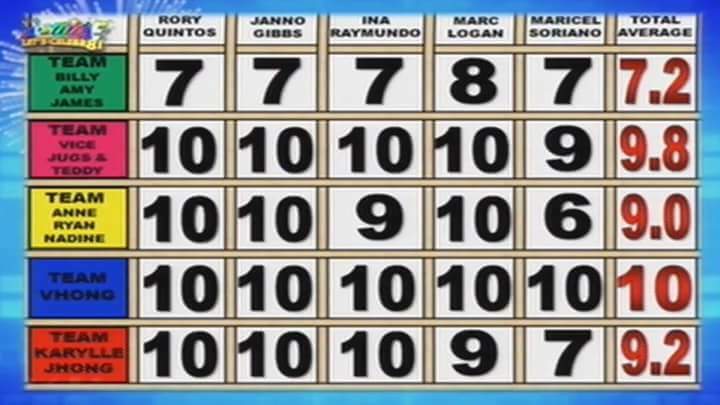 Magpasikat 2017 judges' scores, results. Last year, Anne Curtis's team won the grand prize, winning P300,000 for their chosen charity. The month-long anniversary celebration kicked off last Monday (October 2) as the program has given viewers a daily musical treat with world-class performances by the ABS-CBN’s finest singers.